Zahara sneaking a bone, in the totally obvious way that GSs are known for. As October approaches the world starts craving all things Pumpkin Spice! Each October I make a batch of Pumpkin Spice stuffing mixture, but pumpkin is so healthy for dogs that you can add it to any stuffing recipe. As with all my stuffing recipes, please note, I make huge quantities and stuff every Kong, Squirrel Dude, bone, hoof, and West Paw Zogoflex Tux that I have in the house and I just judge everything by eye, so please adjust amounts to suit your preferences. 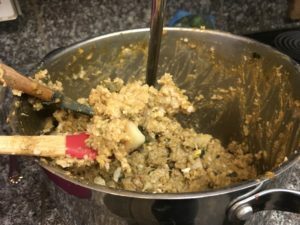 This is an oatmeal based recipe and as such it’s sticky, sticky stuffing are more DIFFICULT for your dog to extract, taking more time and effort. 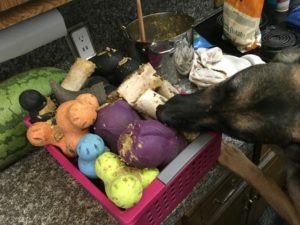 If your dog is new to enrichment see the bottom of the recipe for ways to make this activity easier or more difficult based on your dogs skill and drive level. Oatmeal, either Old Fashioned, Steel Cut, or Instant, UNFLAVORED without sugar, or flavor added. I’m using Quaker Instant Oatmeal because I found it on sale, I usually use Old Fashioned Oats. 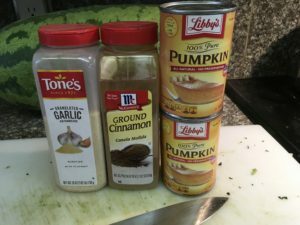 Canned Pumpkin, or any cooked and mashed squash. Eggs: The entire egg, shell and all. Coconut Oil or Olive Oil (optional) some dogs cannot tolerate supplemental oil, others can. Know your dog. Spice: Granulated Garlic and Ground Cinnamon. Veg: Whatever you have! 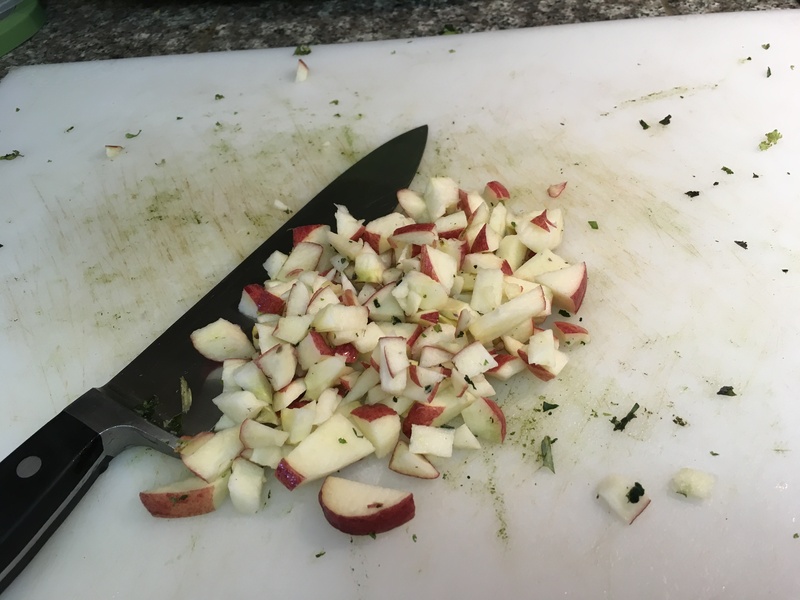 I used apple and rainbow kale, coarsly chopped. 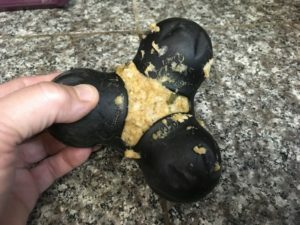 I ALWAYS save the fine dust that is left over in treat packages, biscuit boxes, or when I chop up rolled dog treats (Natural Balance and Redbarn Rolls leave TONS of crumbs!) and instead of throwing these yummy bits away I save them in a plastic tub in the fridge. When I made this recipe I happened to have crumbs from chopping up Natural Balance Rolls into treats and so I poured that in this recipe. 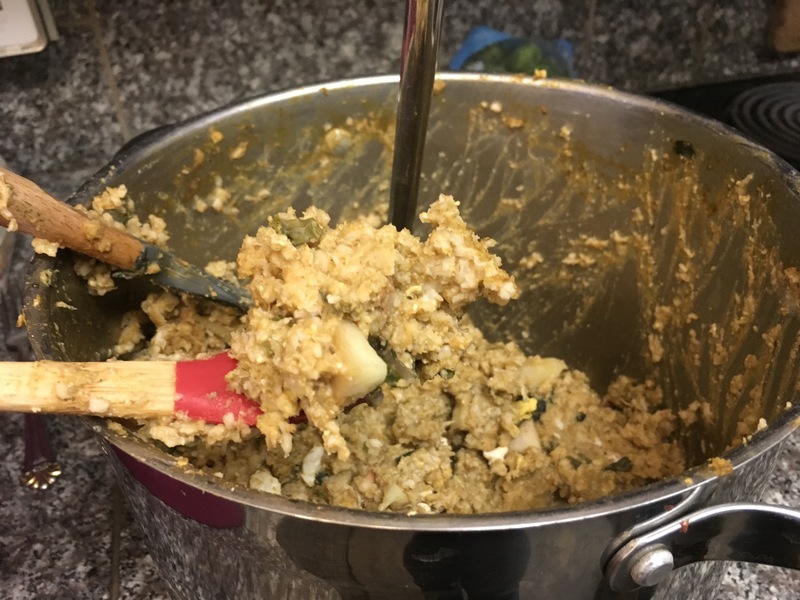 Quantities: I make a huge batch and here is the recipe for that, followed by a smaller recipe for a single GS sized dog with 7 stuffable dispensers (Kongs, Squirrel Dudes etc). 1 dozen eggs, shell and all. 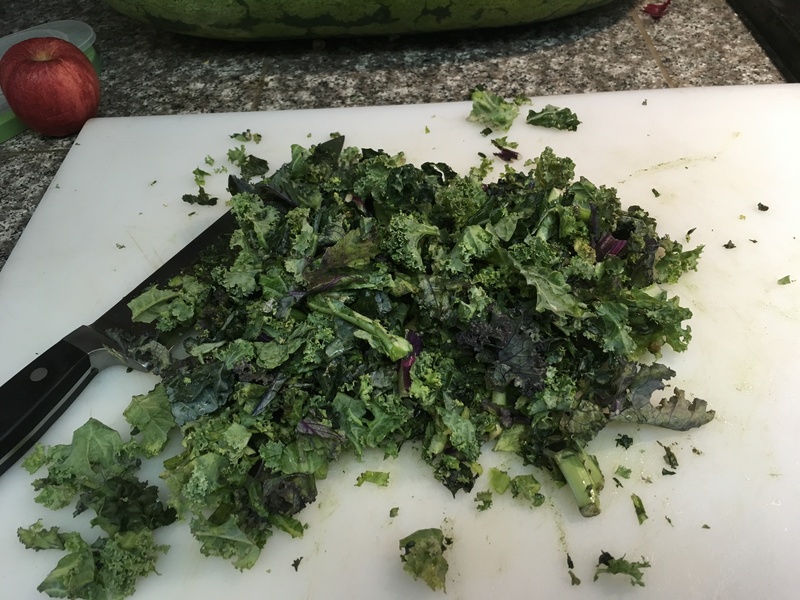 4 Cups Vegetable (I used Rainbow Kale and Apple) coarsely chopped. Only use dog safe fruits and veggies! 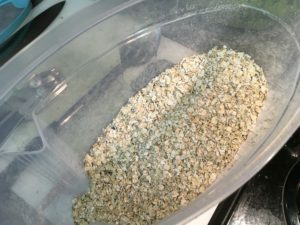 Optional: Treat dust (I had 1 Cups worth, oil, I used 1/4 Cup Coconut Oil). Optional: Treat Dust or 1 tsp oil. I seriously eye ball this recipe because I’m going for a particular texture (sticky and clumpy) and not regular people eating oatmeal texture! In your 8 quart stockpot over medium heat, add the amount of water recommended on the Oatmeal package (I start with 2 cups water per 1 cup uncooked oats, adding more water if needed). Bring the water to a simmer and add all your veggies and fruit, cook lightly (dogs can’t digest plant matter unless it’s lightly cooked or puréed). To simmering water/veggie mixture add eggs and stir to break eggs up as much/little as desired. Cook until just set, about 2 minutes. Add canned Pumpkin or mashed squash, stir to combine and heat through and return to a low boil. Add Oil (optional), treat dust (optional), spices (also optional really), and Oatmeal. 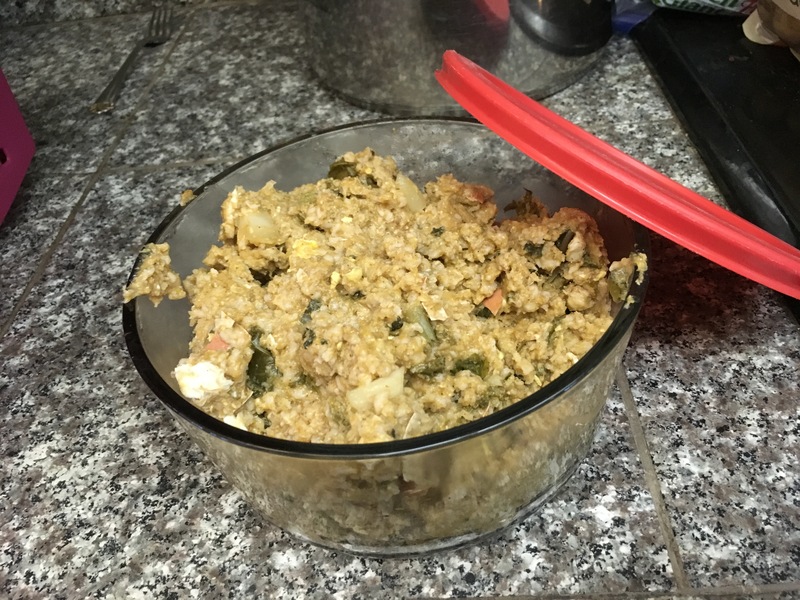 Reduce heat to medium/low, you want the mixture to just barely boil, enough to cook the oatmeal. 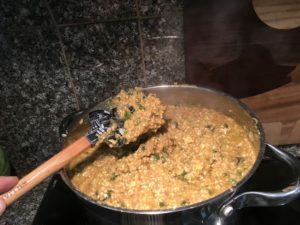 Quickly stir to mix all ingredients, the mixture should thicken up rather quickly, so combine while you can. Once well combined, and the oats cooked, remove from heat and allow to stand until cool enough to handle with your hands. Mixture should thicken considerably upon cooling. 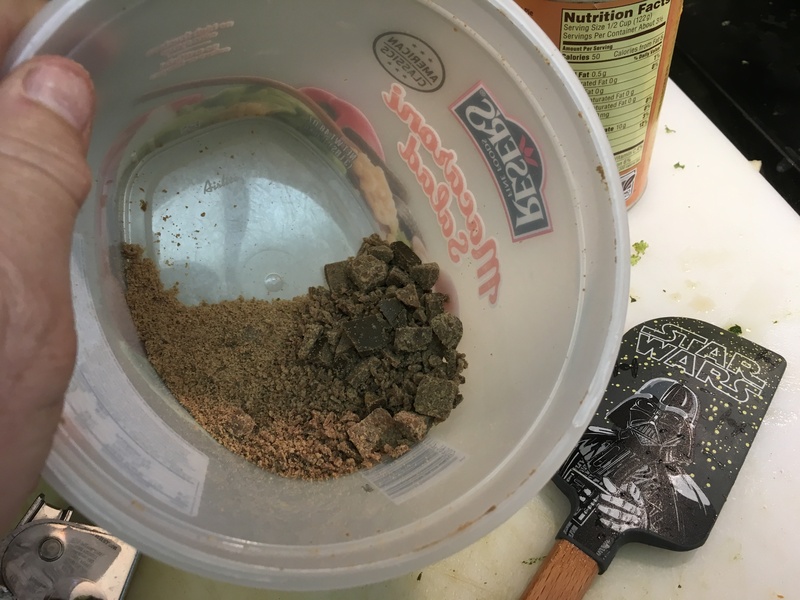 Once the mixture is cool enough to handle it should be really thick and gummy, almost like cookie dough consistency. It sticks to EVERYTHING! 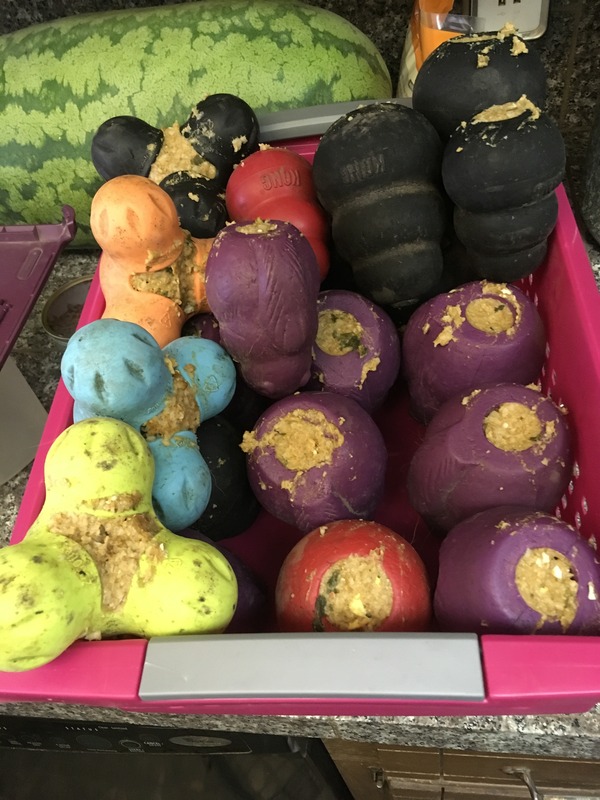 This makes it really challenging to get out of a Kong. Stuff, Stuff, Stuff! 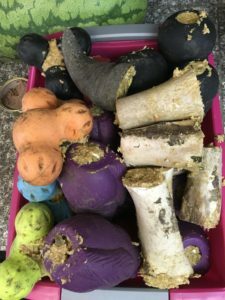 I stuff this into Kongs, Squirrel Dudes, cows hooves (for puppies/seniors only), Tux, and short shank bones. You could also stuff this into a lick mat or slow feeder bowl. Tux, Kongs, and Squirrel Dudes. Save the extra! This mixture is sticky enough that I also save some back and use this like a Pill Pocket, to wrap around pills so the dogs will eat them. I also use it like canned food, to mix in with dry food at meal times. 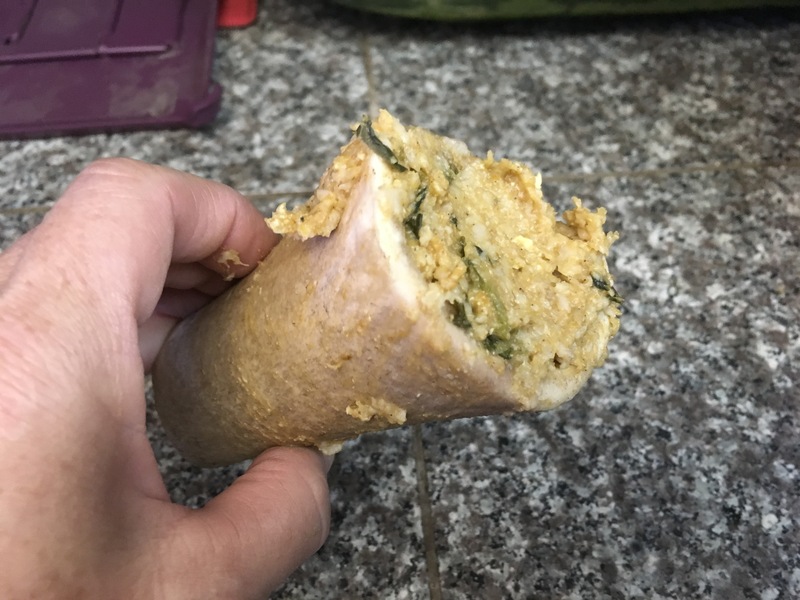 It freezes well too, and can be used as a stuffing after being thawed. The large recipe stuffs about 30 different items. The small recipe will stuff about 10, depending of course on the volume of the item being stuffed. Remember, you can adjust the recipe to suit your needs! 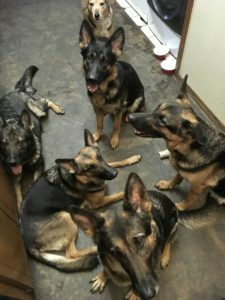 Dogs benefit greatly from relaxing activities such as food dispensers, you can use this Relaxing Activity to balance Arousing activities such as fetch, tug, agility, or obedience to help your dog relax. 1. Fill the Kong half way full with kibble before stuffing. 2. Coat the inside of the Kong with butter, coconut, or olive oil. 3. Fill a slow feed bowl, or lick mat instead of a Kong or Squirrel Dude. 4. Feed it fresh instead of frozen.